Take a peek into how the two-time Olympia Bikini winner preps to take home the win on the international stage. Dedication, determination, and a strong work ethic—these are the attributes an athlete must possess in order to take home the crown at the Olympia. But, while essential, these traits are the bare minimum needed to even scratch the surface of greatness. There's so much more involved than most people ever realize, but Ashley Kaltwasser is here to give you a glimpse into what it's like to reign supreme at one of the biggest bodybuilding contests in the world—and win it twice. If you have hopes of one day walking out onto the stage at a high-level competition, or you're simply curious about the process, here's an insider look at what it takes to be successful on an international level. An integral part of succeeding in a contest—or placing at all—is understanding when to start your prep period. "I tried something different this time around and completed a six-week prep period," Ashley says, referring to the method she used to take home her September 2014 win. The time when you should begin your prep period will depend heavily on your starting point and how you've trained and maintained during the off-season. While Ashley didn't weigh herself when she first started her prep period, she estimates she was about six pounds out from her ideal contest weight. To start the fat-burning process, Ashley increased her cardio training. "I typically did three sessions of HIIT on the StepMill or elliptical during the week, and took part in a 5K road race on the weekend," she says. "The 5Ks were a great way to push myself, and were a lot of fun at the same time." For many fitness competitors, two-a-day cardio sessions are not unheard of, so finding a way to make cardio fun is essential. Ashley credits a big part of her success to her ever-changing workout routine. "I try to avoid doing the same thing twice in a row," she explains. "Factors such as distance, time, and rest breaks were always switched up so that my body never started to adapt." On those extra-hard days when she just didn't feel like doing yet another session, Ashley would start thinking about how she'd feel if she skipped it. "The guilt of skipping a workout is much worse for me than the one-hour workout that I'd have to endure," she says. "That helped motivate me to get through it." 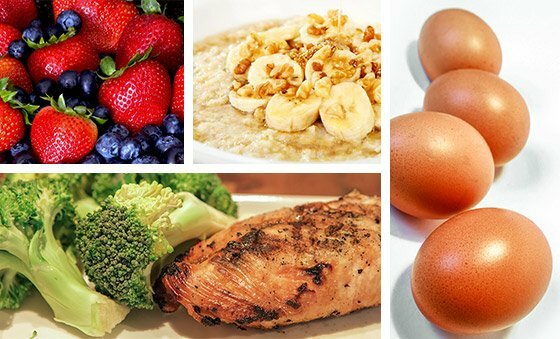 If you're prepping for a solid 12 weeks or more, you can be slightly more flexible with your diet and allow room for a few cheats here and there. However, since Ashley's prep was just six weeks long, she took no shortcuts with her diet, and no cheat meals were included in the mix. "I had to be on 100 percent of the time," she says. "There simply was no room for error or experimentation." After the contest was done however, she did let herself indulge at the Athletes' Gala—at least a little. She was competing again in a week, so she couldn't go too overboard, but Ashley made sure to get some carbs and fats with her protein. She had a steak salad with cheese, blue cheese dressing, and a few dinner rolls. While that might not seem like extreme "unclean eating," it was a far cry from the staples she'd been limited to during her six weeks of prep—MuscleEgg (egg whites), turkey, chicken, steak, Greek yogurt, cottage cheese, and beef jerky were her protein sources. She also ate complex carbs in the form of oats, whole-grain bread, brown rice, white potato, sweet potato, Cream of Wheat, and Cream of Rice. Ashley kept some fruit in her diet plan by eating bananas, grapefruit, prunes, blueberries, and strawberries regularly. She supplemented that with plenty of vegetables, including Brussels sprouts, broccoli, asparagus, romaine lettuce, cauliflower, and green beans. Fat was kept low, to assist with the fat-burning process, and came strictly from the protein sources she consumed. For Ashley, the hardest part of contest dieting wasn't the food cravings or even the hunger, but rather, always being prepared. "It's hard always having to bring food with you while traveling," she says, "but if you want to succeed, it's a must." When hunger struck, Ashley had a plan. "I drank water, and lots of it!" she says. Ashley aimed for about two gallons of water per day, and made sure she had Gaspari Aminolast as part of her daily regime along with Crystal Light and coffee. She also kept a pack of sugar-free gum on her at all times to keep sweet-tooth cravings at bay. When she needed a quick nibble, Ashley reached for low-calorie whole foods that she adapted to meet her sweet or savory cravings. "My go-to snacks were sliced cucumbers with Stevia sprinkled on them, as well as celery sticks dipped in salsa," Ashley says. Along with her Aminolast, she also regularly included Gaspari Nutrition IsoFusion in her day, along with >Detonate XT and Anavite. "I started using DetonateXT about one month out in order to help me lean out," Ashley says. "In addition to that, it really helped me through my prep by giving me energy whenever I started to feel tired and sluggish." Fortunately, even when she felt like dragging, Ashley's desire to make history and be the first woman to ever win a repeat Bikini Olympia was constantly on her mind. These goals motivated her to push through hard times. So, what did a day in the life of Ashley look like as she prepared for the Olympia? With travel, it wasn't as consistent as you might think. "It seemed like I was gone more than home, so my schedule differed," she says. But that doesn't mean there was a lack of structure. "Assuming I was home, I had a set plan," Ashley adds. Upon waking, Ashley eats her first meal, then takes care of business by answering emails for 30 minutes. She then gets ready to kick off her day with a sweat session at the gym. Before entering the gym to carve her physique into stage-ready condition, Ashley hits a Dunkin Donuts, grabs a medium black iced coffee, and adds in a scoop of Gaspari Nutrition IsoFusion with some Stevia. She sips this "pre-workout mix" before lifting. Once she gets to the gym, Ashley hits the weights for about an hour, does some post-workout stretching, and then gets ready for her next meal. After some bikini posing with her coach, Ashley gets back on the computer for Skype posing sessions with her clients. Once finished, she heads back home to eat another meal. After doing some work on her "FitnessRX Women" articles and posting on social media, Ashley gets in another meal before heading back to the gym for HIIT cardio, stretching, and foam rolling. Once the gym is over, she runs some errands, then head back home to relax, take a shower, and either watch TV or browse social media feeds. Before day's end, she has her last meal and heads off to bed. Since Ashley competed in the South Korea Grand Prix shortly after the Olympia, she didn't have much downtime. She continued on with her normal in-season training schedule until that show was completed, and her hard work once again paid off with a first-place win. After that, she took a well-deserved break. "When I arrived home from South Korea, I took one week off from my diet and training," she says. During her week off, she ate a little more than usual, to give her a body a break from dieting, but she stayed away from crazy extremes. "I indulged in a few sweets and treats, but I never binged," she explains. "It's important to listen to your body—if you feel full, stop eating. Don't get cravings confused with hunger," she states. But downtime never lasts long. For Ashley, one big lesson she learned during the Olympia was how to peak herself at the right time. "It was the best peak week I've ever had," she says, after having tried new diet and exercise techniques. That's why, after her week of fun was over, Ashley resumed a healthier eating plan as part of her prep for competing in the Moscow Russia Pro Bikini show at the end of November, a mere month away. "Now my mission is to stay within a month's reach of [my] stage body—about five pounds—so getting prepped for Moscow won't be too demanding," Ashley says. And just like that, she's focused on doing what she knows best—training hard. For anyone seriously considering getting involved in competing, Ashley recommends doing some research first. "YouTube NPC and IFBB Bikini Shows," she says, "Be sure to check out www.npcnewsonline.com." Ashley also stresses the importance of hiring a coach who knows the industry well and who will help you walk onstage at your very best.